Norway continues to turn out good films with this story of government conspiracy (in Norway? *), trolls, and the man who fights the good fight. This country’s specialty seems to be dry, sarcastic, cynical, ancient men who lecture Today’s Youth about The Way Things Are and deal with the world because no one else will, especially this silly new generation. Okay, you know when you see at the top of the movie that it’s “reconstructed from ‘found’ material” that none of the main characters are going to live through it. I know that we’re not allowed to have anything but a depressing, hopeless ending to movies these days, but it bugs me to know it up front. It’s darned near impossible to invest in characters you know are walking dead, and for some reason makes the end of the film nearly unbearably sad, despite knowing how it’s going to end. You find yourself making up scenarios to brighten things up a bit. For this one I’ve got the trolljegeren walking off to go live with the veterinarian who likes him so much. The sound girl talks the evil government guys (Evil government guys in Norway? Unsettling.) into letting her become the new trollhunter, now that Hans has wandered off. The reporter snags a ride with the truck driver seen at the last moment and is the one who sends in the video. The Muslim camerawoman seems to be s.o.l., though, and who knows where the seismologist wandered off to. CFR Notes: I also reviewed the movie and liked it very very much! 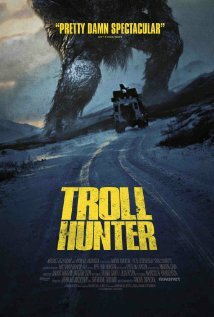 You can read the review here: Movie Review: Trollhunter. Links to movie Websites will be on this review. *Yes the movie does indeed take place in Norway.